ROCCO’s independent survey of 170 Mobile Network Operators (MNO) places Anam’s ASSURE solution at the top. 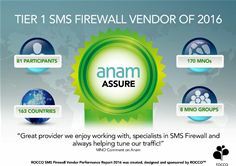 Anam’s ASSURE solution has shot into a leading position in a survey of MNO opinions on A2P SMS Firewall vendors, as well as earning a coveted Tier 1 supplier status. The comprehensive study asked MNOs to rate 16 leading vendors on 40+ KPIs across multiple aspects of the solution including Business Understanding, Technological Capability, Performance, Reporting and Leadership. Anam’s solution scored consistently high on all KPIs earning itself a prestigious Tier #1 status. Commenting on the report findings, Anam CCO, Brian D’Arcy said that “Anam’s A2P monetisation services reflect close linkage and understanding of the Mobile Operator position. This is a highly complex ecosystem with varied agendas and objectives. Achieving early and incremental revenue gains on Grey Route traffic for the operator is Anam’s concern and the intelligent reporting element of our solution is essential for dynamic A2P traffic monitoring and anomaly detection”. Already an acknowledged heavyweight in terms of SMS technology, Anam invented and owns the patent for Home Routing – a technique fundamental to SMS firewalls. The company has focused on building its A2P business and analytical capability to leverage the Mobile Operators filtering capability. Anam is the fastest growing independent SMS Firewall and A2P Monetisation service provider in the world, filtering billions of messages for Mobile Operators in over 60 countries. Anam’s team of Industry leading A2P consultants leverage firewall technology to enable Mobile Operators to generate new revenues from A2P SMS traffic on their networks whilst also eliminating SMS SPAM. The company’s offering has generated incremental revenues in excess of $2million per annum for every 1 million subscribers. On the network signalling side, Anam’s Managed Signaling Firewall protects the mobile network from the well publicised attacks arriving over the global SS7 & Diameter networks. This same technology serves as a monetization platform for a variety of location based & mobile identity services. Anam owns the worldwide patent for Home Routing (EP 1683375 B1), a technique invented in 2006 and fundamental to SMS Firewalls. Anam is hosting the GSMA WAS#4 meeting in Dublin from October 31 – Nov 3rd, 2016. The event, which has already reached the 1000 delegate capacity, focuses on International business needs of Mobile Operators. ROCCO is the 100% neutral Research, Strategy and Education Company based in the UK. For 3.5 years we have providing research into Roaming and Interconnect Vendors on behalf of Mobile Network Operators interested in making the right Vendor decisions as well as on all kinds of hot topics that interest them. Over 500 MNOs contribute to our research annually.